Are you paying off debt the right way? As the economy has started showing some glimpses of hope, Americans have once again started piling up debt. As the economy has started showing some glimpses of hope, Americans have once again started piling up debt. And if we listen to the experts, just like last time, they are going to make big mistakes this time too while paying off their debt.According to latest data from the Federal Reserve, total outstanding revolving credit card debt reached $873.1 billion at the end of June 2014. According to personal finance site NerdWallet.com and Federal Reserve, today the average American household has around $15,480 in credit card debt, $156,474 in mortgage debt and $33,424 in student loan debt. People, when down with enormous debt, often make silly mistakes just because they freak out. They just try to put a band-aid on the problem. This way they try to keep it behind a curtain as well as hope it'd heal up the financial wounds. There are many faster and smarter ways to pay off debt. Debt settlement and bankruptcy should always be considered as the last option. Many debtors think it wise to concentrate on paying off the credit card debt with the highest interest rate first, while making smaller or just the minimum payments on the other ones. If you are a like minded consumer, did you ever check how much you save by doing this or how soon you pay off your debts? A couple paid off $125000 in credit card debt over four years. But they had decided to pay off the debt with the lowest interest rate first since it gave them some kind of boost to go after the second highest one. Getting out of debt is nothing but losing weight and getting in good shape. Both require dedication and discipline. Prepare a list of things to do and just go for it. First try to shed off the fats that bother you the most. Work extra on those!! Get some refreshment once you accomplish a milestone. Get yourself a gift or go for a lunch with your family. This will undoubtedly provide you with the energy necessary to attack your next debt. If you are up to nose in debt, but haven't missed a payment yet, make sure you don't. If you do, you'll just create problems for you. If you are current on your payments and haven't missed a payment since the beginning, you always have the opportunity to negotiate with your creditors to cut down interest rates. A bank or any traditional lender would definitely be more interested in getting your interest rates reduced to something convenient for you than making you default and getting nothing from you at all. 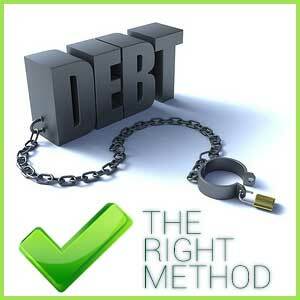 Do you know the difference between debt management and debt settlement? Debt management services are usually offered by non-profit companies that are accredited by National Foundation for Credit Counseling (NFCC), while the latter includes for-profit companies. If you confuse among the two, you're going to suffer loss of thousands of dollars. As the debt settlement companies mushroomed after the financial crunch, complaints about them snowballed too. A common practice of the debt settlement is asking you to stop making payment and instead, pay towards them in the hope of a lump sum settlement. This tremendously hurts your credit score and in most cases, you see either you're summoned in court or paying hefty fees to the settlement company at the end of the program. It's not that credit scores don't get hurt in a debt management program. But as soon as you start making payments through a monthly program, the scores start taking good shapes. Student debt holder who work in the public sector, for the government or for a non-profit organization, should look for if they are eligible for debt forgiveness. As per the government's Public Service Loan Forgiveness Program, borrowers who are in public service can apply for loan forgiveness for the remaining balance of their Direct Loans only after making 120 successful payments. These loans are called Direct Loans as they come from the Department of Education.